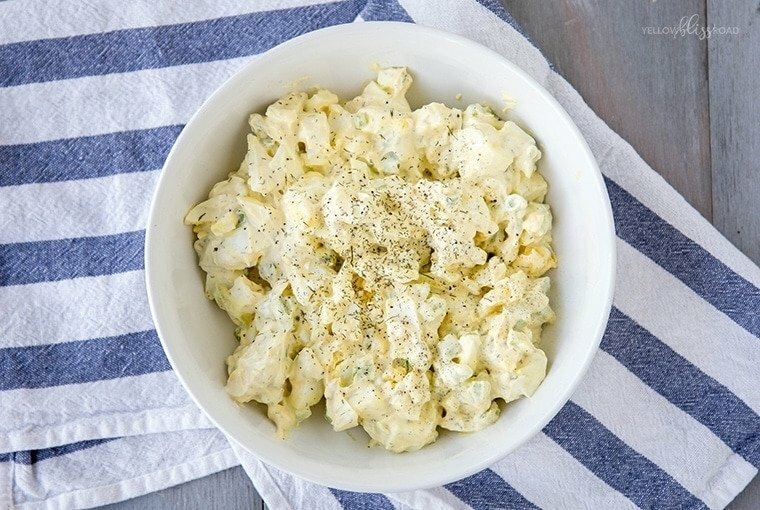 This Lightened Up Egg Salad is a classic recipe that is super creamy and flavorful. 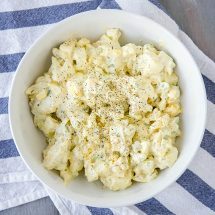 It’s made with Greek Yogurt and just a touch of mayo for a rich and creamy egg salad dressing, that saves a few calories. I have only developed a love for egg salad in the past few years. For some reason, maybe it was the texture, I never really cared for it. But this recipe is made with Greek Yogurt, which I love in salads like my Skinny Southwest Chicken Salad and Creamy Chicken and Veggie Pasta Salad, and it has celery and green onions for crunch. 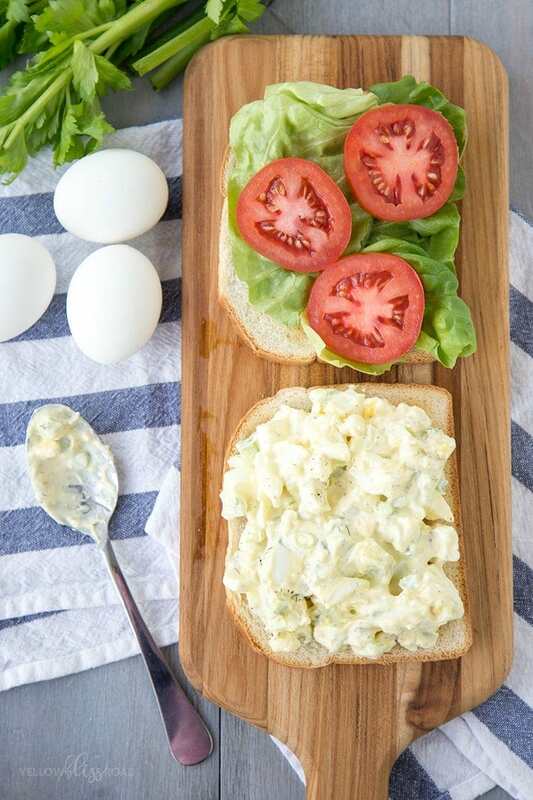 The key to the perfect egg salad sandwich is of course the hard boiled eggs so be sure to check out my tips for getting perfect hard boiled eggs every time. I like to leave the eggs in nice big chunks, and then salt and pepper them before mixing them with the rest of the ingredients for the best flavor. You can also use an egg slicer to get perfect cuts. HOW DO YOU MAKE THE BEST HARD BOILED EGGS? Add a dozen eggs to a large sauce pan in a single layer and add cold water. You want the water to be about an inch higher than the eggs. Bring the eggs to a boil, uncovered, over medium-high heat, then turn off the heat and cover the pan for 12 minutes. Transfer the eggs to an ice bath to cool and stop the cooking process. Start with peeled hard boiled eggs and chop them up roughly or mash with a potato masher, depending on how large you want the chunks of egg to be. Season the eggs with salt and pepper. The egg salad dressing isn’t hard at all to whip up either. 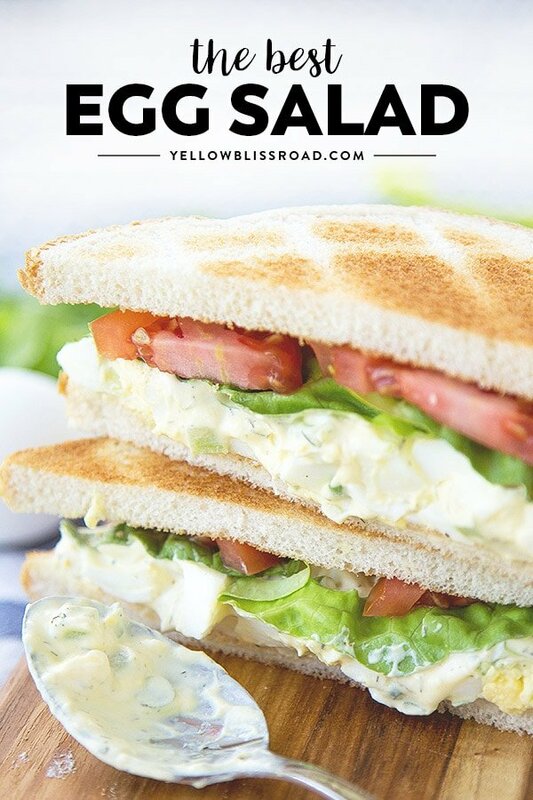 Mix together Greek Yogurt with a little mayo and Dijon mustard, dill and a pinch of garlic powder for flavor. Then add the crunchy celery and green onions. The eggs come last and are just coated in all that creamy goodness. Taste and add more salt and pepper, mayo or mustard until the taste is to your liking. Now all that’s left is to grab a spoon and dig in. Or if you’re feeling a little crazy, spread it nice and thick on some toasted bread with lettuce and tomato or eat it on crackers. It’s great in lettuce wraps, too! That’s all there is to this amazingly creamy, flavorful egg salad! WHAT DO YOU EAT WITH EGG SALAD? Egg Salad is delicious served in a variety of ways. You can serve it on it’s own, or customize with your favorite flavors. Some people like dill pickles or pickle relish in their egg salad to give it crunch, but I’m not a big fan of pickles in anything. Instead I add dried dill and celery for crunch. 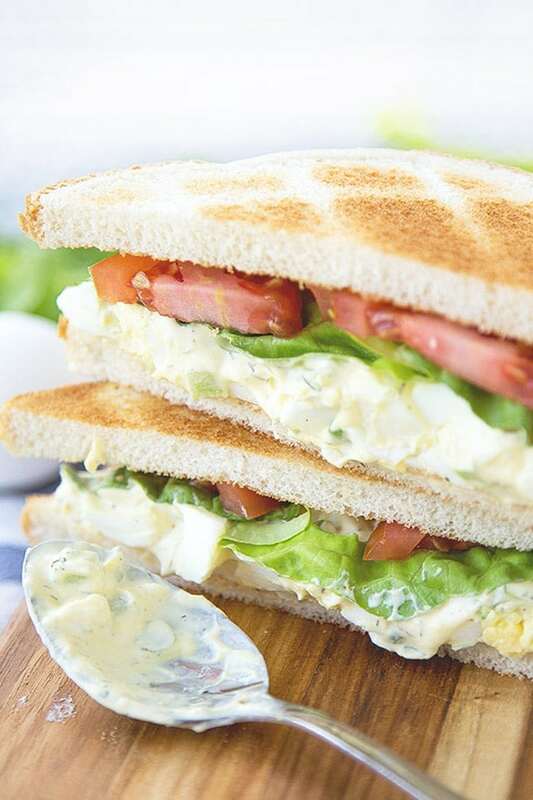 Serve egg salad heaped on crackers, toast, croissants. Add some healthy protein with canned tuna or shredded chicken for a more substantial meal. Add some bacon for a salty, savory snack. Replace the Greek yogurt with creamy avocado. HOW DO YOU STORE EGG SALAD? 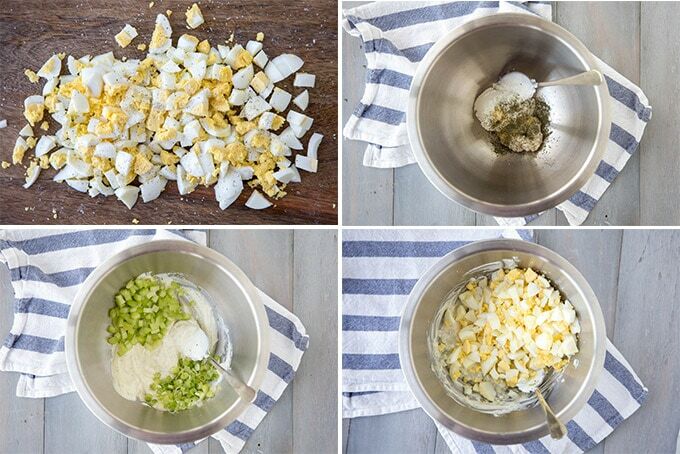 Store any leftover egg salad in a bowl, cover and chill in the fridge until ready to serve. This salad should not be left out for longer than 30 minutes or it can spoil. HOW LONG IS EGG SALAD GOOD FOR? When stored properly, Egg Salad can be stored in the fridge for up to 3 days. Roughly chop eggs and sprinkle with a pinch of kosher salt and pepper. In a medium size bowl, combine Greek yogurt, mayo, Dijon mustard, garlic powder and dried dill. Stir in green onions and celery. Add the chopped hard boiled eggs and stir to coat completely. Taste and add more salt and pepper to your liking. Cover and chill in the fridge until ready to serve. Can be stored in the fridge for up to 3 days. Serve on crackers, toast, croissants or on it's own. For all recipes on the site, go HERE.